So recently I was sent a complimentary unit from Waxaway to use at home. It was a unit of their Waxaway Sensitive Skin Formula. To use the wax unit, first I heated up the wax unit in the microwave in multiple of 30 seconds. I had to do this a few times, possibly up to 2.5 minutes as the wax took a while to liquidate. 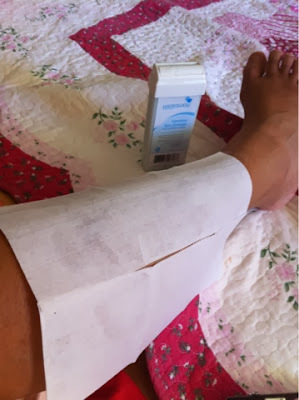 After I warmed up the wax, I applied it on my test area- my legs, and placed the pulling paper (?) over the wax area. 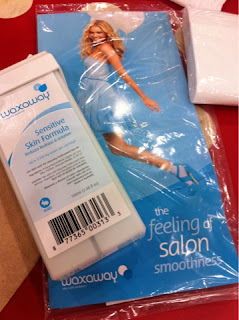 I used the single one use sachet of the Waxaway After Care Wipe which was included in my complimentary unit. It was a lot easier to remove any excess wax residue, with a bit of an oil slick. Cons: If you prefer the razor, then waxing is not for you. Being a virgin DIY wax user, the waxing process seems fairly straight forward enough, just that it took longer than my usual razors. If you like using pre-made waxes, go for it! This unit retails at AUD7.30 at all leading pharmacists and chemists in Australia.